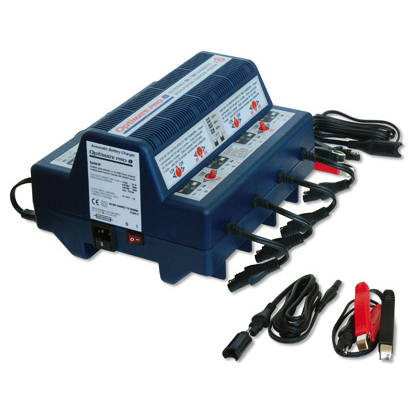 This 8-bank shop charger can desulfate, recover, charge, test, & maintain up to 8 x batteries simultaneously and is ideal for maintaining 6V & 12V batteries . Simply connect a battery and the rest is automatic. 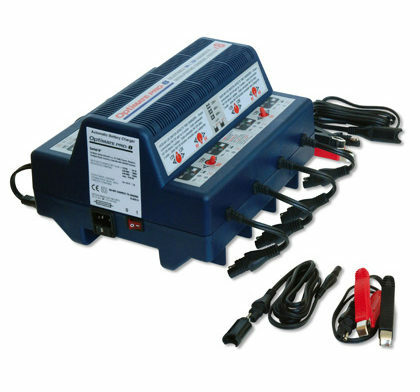 SKU: OMPRO8 Category: Workshop Battery Chargers Brands: Optimate. The new OptiMate PRO 8 is a highly versatile 6/12V battery-care centre for up to 8 batteries at a time. Compatible with all lead-acid models, GEL, MF-AGM or conventional, the new OptiMate PRO 8 can be used on starter batteries, as well as on industrial, motive or stationary-oriented types. 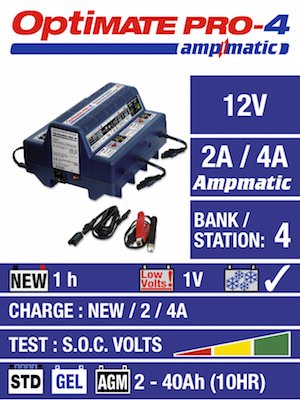 Just connect up to 8 (even dissimilar) batteries, and these will be individually taken through OptiMate’s widely acclaimed multi-stage programme: Desulfation (if necessary), constant current bulk charge, verification, final test & limitless maintenance. Countless connection variations are possible, either enhancing charge current for larger batteries, or handling series-connected blocks, or both. Combinations up to 8A or 96V are possible. State-of-the-art diagnostics, charging, testing and recovery of otherwise “dead” batteries”, all in a single device. Charges up to 8 batteries at the same time. 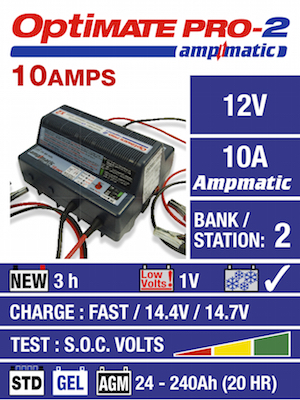 For 6 and 12V batteries STD, AGM, Deep Cycle. Battery test and self-discharge check. Keeps batteries fully charged at all times. Select rated output voltage (6 or 12V). Each selection toggle switch governs two charging stations. Each station delivers a 1 constant Amp charging current during the main (or “bulk”) charging stage. One, more, or even all stations can be connected to a single battery or battery-block for a constant charging current of up to 8A, or for a (up to) 96V-block charge at 1 Amp, provided a uniform selection has been made on all pairs (6 or 12V). 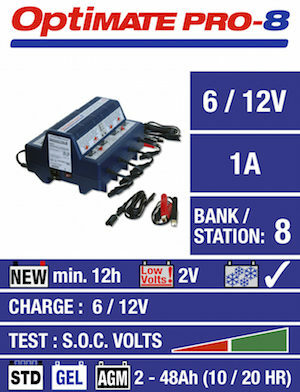 As an example, one can use 4 stations (2 pairs) to maximise output current on one large 6V-battery (4A), and use the remaining 4 stations to charge a quartet of series-connected 12V-batteries, in effect charging a 48V-block at 1 Amp, without any need for decoupling. The same goes for parallel-connected blocks of either 6 or 12V. Connect at least 1 output to each individual battery you want to be treated, whether used as a stand-alone or as part of a block that’s either connected in parallel or in series. OptiMate PRO 8 is of course protected against wrong polarity connections and spark formation, ensuring a perfectly safe operation. Initialisation: OptiMate PRO 8 checks that it is connected to a battery ( = minimum voltage 1.8V). 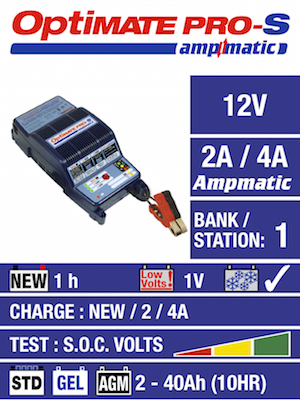 Programming: Each OptiMate PRO 8 output requires connection to a battery (of minimum voltage 1.8V) to activate. Desulfation and recovery: if necessary, a high voltage is applied to recover neglected, flat batteries (removed from the vehicle or equipment) from sulphation to a chargeable state. Bulk charge: a 1A constant current optimally charges each individual battery according to its evolving electrical characteristics. Charge verification: the voltage is limited at 13.6V during 30 minutes, while the programme monitors the current absorbed by the battery. If this reveals a less than optimal charge within this period, the program reverts to bulk as many times as necessary, ensuring a charge as complete as each battery’s status permits. During this stage, the current is delivered in pulses, which engenders voltage peaks in the battery. This process contributes to equalising the cells, therefore leading to an optimal activation of new batteries, including the more “difficult” MF-AGM models. Charge retention test: when the optimal charge has been achieved, a 30-minute check for battery (and connected system) power leakage commences. The result can be read at a glance on the easy-to-read, individual LED panel. 30 minute tests are repeated hourly until the OptiMate PRO 8 is disconnected, so that the battery status indication is continually updated. 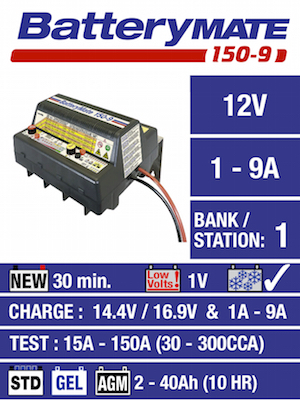 Charge maintenance: during alternate 30 minute periods, at a float limit of 13.6V the battery is offered whatever charge current it needs to sustain it against any small connected loads or power leakage and against natural self-discharge.